Day one of the new season and the Dagger Diary team are in full swing, although a few hundred miles away from Fleetwood Town. When the Football League fixtures were announced in mid-June, the Daggers were given a nice opening day jaunt to the Lancashire coast, to play Fleetwood Town. Despite the fact that it would almost certainly be warmer than our previous visit in March, I was unsure about whether or not I would attend. In years gone by, I would have considered it sacrilege to have missed the opening game of the season, no matter where it was. Now, I have changed that a bit, and I really wasn’t that fussed if I attended or not. As time passed, I started (albeit, at an almost glacial pace) to come round to the idea of going. After all, it would be the first game of the season, and although friendly games are ok, they don’t really match the intensity of the league games. Then, I changed my mind again, and decided to go elsewhere instead. Barcelona announced that their Gamper Trophy game would be on August 2nd, against Santos, presumably as part of the deal that took Neymar to the Camp Nou. If I could get the appropriate flight back, perhaps both games would be a possibility? Well, no it wouldn’t. After looking through, I thought that I would be unable to get to Fleetwood from whichever airport I would go to, so with a decision to be made, I elected to just do the Friday night game. With flights, hotel and match ticket all now booked, I was on my way to Spain once again. The only thing that made me a bit nervous about booking this one would be what kind of team Barcelona would be fielding. With those that appeared for the Spanish national team in the recent Confederations Cup only just back in training, and the league season still a couple of weeks away, the team could be a mixture of reserve players and kids, or just the reserve (or “B”) side. Still, the chance to see Santos was enough to persuade me to part with the cash for the trip, and it was that factor that meant that Fleetwood (as nice as it is) could go whistle. Not only would the game be Barca’s first home game of the season, but there would be the annual presentation of the squad to the supporters prior to the game. Although they have already been playing games in Poland, Germany and Norway, there is still the trip to the Far East (to play Thailand and a Malaysia XI) and the two-legged Spanish Super Cup to come after this one, which means that the big name players might miss this one, although I really hope not. Having beaten Santos 4-0 in the 2011 World Club Cup final, it would be nice to see the proper first team playing in this one, and it would be even better to see how Neymar fits into the overall plan. A couple of weeks prior to the game all seemed well in the world of the Blaugrana. The club had announced the signing of Neymar, and the squad was being ever so slightly altered. However, it all changed late on Friday 19th July, with the press conference that announced that Tito Vilanova would be stepping down from the position of head coach with immediate effect. Given that he had missed a fair chunk of 2012-13 while in New York for treatment of cancer, it was a bit of surprise, although perhaps it shouldn’t have even been that. Although Jordi Roura had done sterling work while Vilanova was away last season, the club have settled on a new coach and selected Gerardo “Tata” Martino as the new man in charge. While successful in Argentina and with the Paraguay national team, there has been some surprise (certainly in the British media) at the selection. There have even been suggestions that Lionel Messi had a hand in the selection, given that both are from Rosario in Argentina, which just all seems a bit far fetched to me. It’s a warm sunny day in Spain, and as we disembark the plane to head for passport control, there are already people fanning themselves in the face of the Spanish summer sun. The coolness of the terminal building is very welcome, but we are soon on our way back out in the heat, as we wait for the next shuttle bus to the city centre. The first port of call is at the ticket offices at the stadium, to collect my ticket for the game, before a trip to the newly refurbished offices of the clubs membership section. Compared to the old offices (which weren’t that bad, although a bit cramped), these are quite pleasant, and at least the stadium store isn’t right next door, with its various temptations to spend money that I don’t really have. There is a bit more space around the new block; previously situated in the main concourse opposite the Palau Blaugrana and the ice rink, it did get crowded as this also marked the entrance to the museum. Now things are a bit more spread out, and it’s definitely a much better environment. 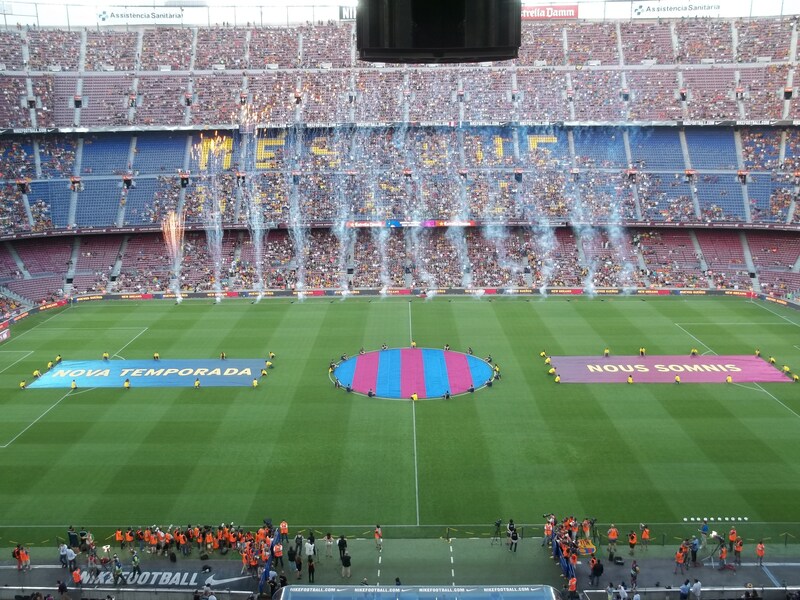 Finally, with the match ticket now secured and the other admin completed, I venture into the Festa Barca, a members only celebration of the Gamper Trophy, which includes the chance to go into the famed Masia academy. Basically it’s an old house situated in the club grounds, towards the north east corner of the stadium, but it’s where many of the current first team squad learned their way. However, when I join the queue for the bus from one side of the car park to the other, I find it’s populated by lots of schoolkids, and the prospect of having to put up with around thirty of them is enough to make me leave the line and head back to do something else. After a wonder around, I leave, and head for the hotel to check in. 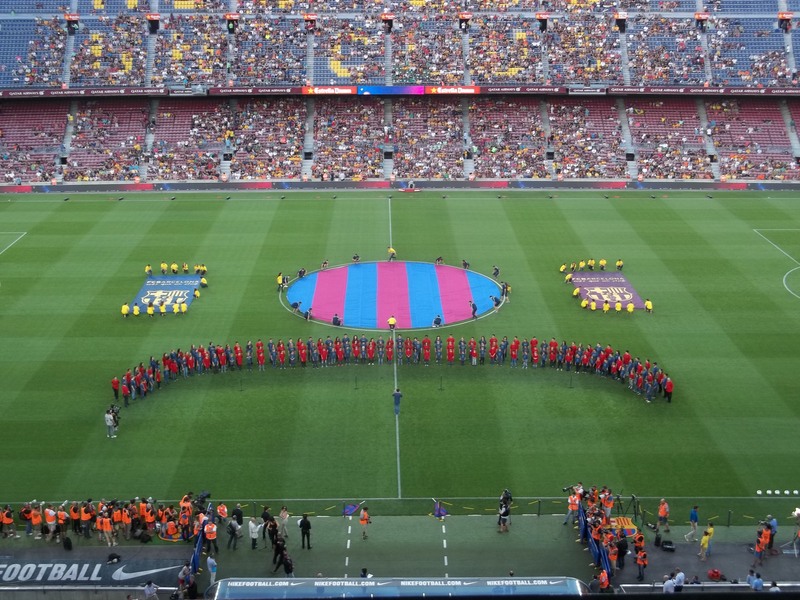 This is the forty-eighth staging of the Gamper trophy, and is named after Joan Gamper, one of the founders of the club. First competed for in the mid-sixties, this invitational game has in the past marked the start of the season for Barca. In recent years though, it has been played at various times in August, and last year, was played twenty four hours after their first league game. Needless to say, not many of the first team played that night, and they lost, 0-1 to Sampdoria. The evening starts with an opening ceremony, which involves lots flags, acrobats and fireworks, before the club anthem is performed on the pitch by a fifty strong choir. Made up of children as well as adults, it is an excellent performance which produces goosebumps by the end of the rendition. They are given a rousing round of applause from those in the stadium, and then the presentations can begin. The back room staff are first up, before the players are then introduced to the crowd. Neymar gets a very good reception, but the loudest is easily for Messi, demonstrating that the new signing may be popular, but he has some way to go to match his fellow South American. The stadium is not full as the game kicks off (which follows a tribute to Antoni Ramallets, who played for Barcelona for fifteen years, and whose name in printed on the Barca goal keeper shirts for the night), although the new kits are very much in evidence from a glance around those in the arena. The away shirt looks the more popular, given a cursory glance around the arena; based on the Catalan flag, it looks like it is another political statement from a club that seems to be pushing itself more and more towards the front of a movement that is pushing for independence from Spain. Whether that is a good idea, I don’t know, and the people of Catalunya will have to make that decision. It’s a different environment in Spain to that here in the UK, and I am quite pleased that our clubs aren’t as political as they can be in Europe. Worrying about the sort of team that Barcelona were going to field should have been the last of my concerns. By the time Santos actually managed to get the ball, there were only five minutes left in the half, and they were already four goals down. The rot had started early, and they could have been behind before Messi scored after seven minutes. An own goal by Leo, followed by goals by Alexis and then Pedro meant that thirty minutes had not been played by the time the game was way, way out of sight from the visitors. Along with Dagenham Dan, I have been to enough Barca games to see them gain a fairly substantial lead by the interval, only to see them ease up for the second half. As the myriad of changes took place on the touchline prior to the start of the second half, I feared the same would happen once again. Either Santos weren’t that bothered, were still jet-lagged, or just had no answer, as Barca, shorn of Iniesta, Xavi, Pique, Dani Alves et al (but with Fabregas, Messi for another sixteen minutes and Neymar) managed to run in another four goals in the second half. The time that Messi and Neymar are on the pitch together is promising, but it will clearly take some time for the partnership to develop. In recent times, new additions have taken time or just not settled at all, so it will be interesting to see how this goes over the next few months. It did seem like an awkward first date at times, but by the end of the sixteen minutes that they were on the field, it did look like they had started talking and discovering mutual interests. In the end, 8-0 could have been ten if efforts from both Fabregas (who scored twice and set up the eighth) and Neymar had not hit the woodwork. So what did we learn about Barcelona for the coming season? Not much; I was expecting a much closer game than it turned out to be, although there are times when a one sided thrashing can be fun to watch, as long as it isn’t your team on the end of it. There is still a need for a centre back, as although Mascherano (or even Sergio Busquets) can fill in, it’s not going to help when they are trying to win the European Cup. Whether Neymar can fit in will be another problem, but hopefully he will fit in well. On the evidence of this game, he should be ok, although the (at times) uncompetitive nature of the league campaign could mean that performances are hyped up; once again, the test will come in Europe. With an afternoon flight home (scheduled to land around 4pm), there were a few hours to spend wandering around the city before catching the bus to the airport. So, with the world swimming championships taking place at the Palau Sant Jordi, next to the Olympic Stadium, I bought myself a ticket, and headed up to the Montjuic for a couple of hours of heats before catching the bus to the airport. At only €15, I thought it would be a decent way to spend the time, and so it proved. 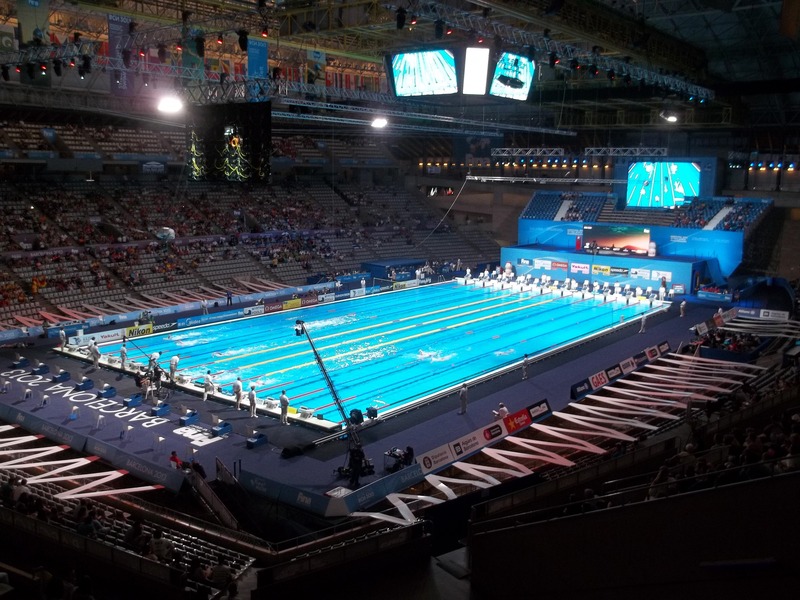 While the first hour was taken up with 50 metre races (we even had a British winner of one of the heats, although they didn’t qualify for the semi finals as they weren’t quite quick enough), the second featured four heats of the 1500 metres, or thirty lengths of the pool. I can quite happily sit and watch a marathon on tv, but I thought that watching people swimming up and down for thirty laps would be a touch boring. Not a bit of it, although probably being there helped. It was quiet, and the fact that the arena was only a third full would not have helped, although the vocal French and German fans did try their best to liven things up. It was certainly a new and different way to end what had been a very brief trip. The football wasn’t bad, and there were signs that Barca were getting their mojo back, although the opposition didn’t help themselves by putting in a very limp performance. Waiting at Southend Airport for the train home, the news from Fleetwood wasn’t good, but although we eventually lost, it had been a good weekend. Roll on the next one. 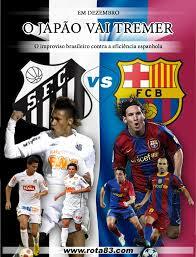 This entry was posted in European Football, Spain and tagged Barcelona, Santos. Bookmark the permalink.